The LA Sparks have traded reserve point guard Andrea Riley, who is seven months pregnant, to the Tulsa Shock in exchange for a second round 2012 draft pick. This opens the way for the Sparks to pick up another player at any position. It will also likely be good for Riley, who went to college in Oklahoma. 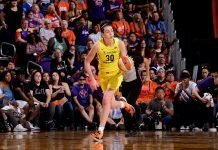 LOS ANGELES – The Los Angeles Sparks have traded guard Andrea Riley to the Tulsa Shock in exchange for a second round pick in the 2012 WNBA Draft, Sparks’ General Manager Penny Toler announced Tuesday. The Dallas, Texas native was drafted in the first round, eighth overall, by the Sparks in 2010. During her rookie season in Los Angeles, the 5’5″ Riley averaged 3.4 points and 1.0 assists in 29 games played. Her career-high 15 points were scored against Phoenix on May 15, 2010, while she dished out a season-best six assists vs. Indiana on Aug. 10. The Sparks begin their 15th WNBA season on Friday, June 3, hosting Minnesota at STAPLES Center at 8 p.m. PT. For group and season ticket information, call 877-44-SPARKS or visit LASparks.com.